Randy Eugene is one of Pittsburgh’s most prolific and renowned guitar/vocalists. He works as a solo artist, as a collaborator, and has formed and fronted many bands in his esteemed career. “The Randy Eugene Band” and “The Randy Eugene ‘Trop Rock’ Band” are two of his current ensembles, plus he is a key member of Pittsburgh’s widely acclaimed “Finesse” band. 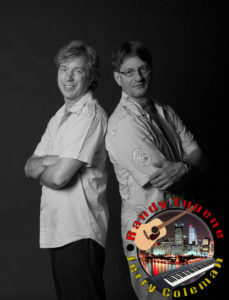 Jerry and Randy are both seasoned instrumentalists and lead vocalists. They specialize in classic pop and soul, but in fact they do it all, with authenticity…. Sinatra, standards, beach, island, country, Motown, and more! Both singers are veteran performers with a keen sense of harmony, and their gravely/smooth vocal blend works a special kind of magic, ala “Righteous Brothers”. Where more instrumentation is called for, they can augment with brass and/or percussion.